This mosaic is believed to represent the god Tezcatlipoca, or “Smoking Mirror,” one of four powerful creator deities, who were amongst the most important gods in the Mexica* pantheon. Tezcatlipoca is often depicted with obsidian mirrors at the head and is conventionally cast as an adversary to Quetzalcoatl. The name “Smoking Mirror” derives from the Nahuatl (Mexica) word tezapoctli, meaning “shining smoke” and representations of Tezcatlipoca are typically characterised by distinctive black stripes on the face and a smoking mirror generally displayed in his headdress, at his temple or in place of a torn-off foot. The mosaic decoration is worked in alternate bands of bright blue turquoise and black lignite. The eyes are made of two orbs of polished iron pyrite framed by rings made of white conch (Strombus) shell. The nasal cavity is lined with plates of bright red Spondylus (thorny oyster) shell. The turquoise, lignite, pyrite and shell were all procured from the farthest reaches of the Mexica empire and beyond. The effort made in assembling this diverse selection of exotic materials emphasises the divine “other-worldly” nature both of the mosaic and whoever wore or displayed it. Turquoise was sent as tribute to the Aztec capital from several provinces of the empire. Some of those provinces were located in present-day Veracruz, Guerrero and Oaxaca. 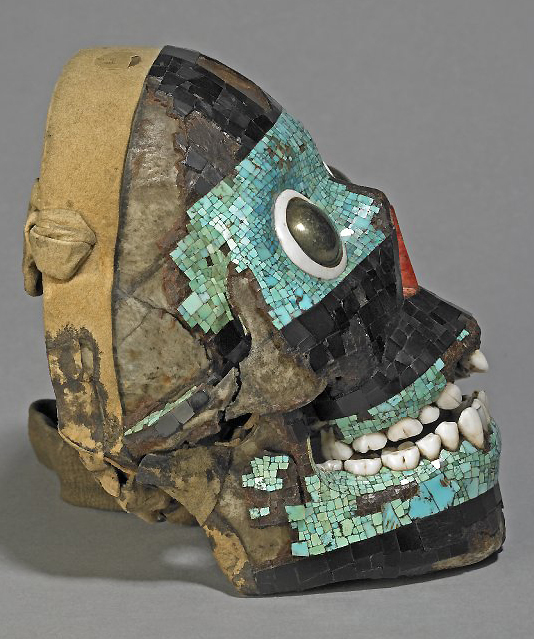 The turquoise was sent as raw chunks or as cut and polished mosaic tiles decorating a variety of objects, such as masks, shields, staffs, discs, knives and bracelets. We know from a tribute list issued by the emperor Moctezuma II that ten turquoise mosaic masks, made by skilled Mixtec artisans, were sent each year from a province in Oaxaca. *The people and culture we know as “Aztec” referred to themselves as the Mexica (pronounced “Mé-shee-ka”). C. R. Cartwright and N. D. Meeks, “Aztec conch shell working: high- tech design,” British Museum Technical Research Bulletin 1, (2007), 35-42. C. McEwan, A. Middleton, C. Cartwright, R. Stacey, Turquoise mosaics from Mexico (London, The British Museum Press, 2006). 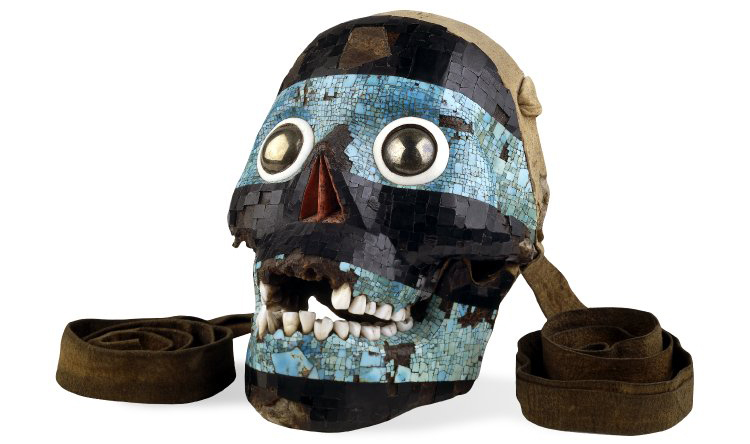 C. McEwan, R. J. Stacey and C. R. Cartwright, “The ‘Tezcatlipoca’ skull mosaic in the British Museum collections: new insights and questions of identity,” E. Baquedano (ed.) 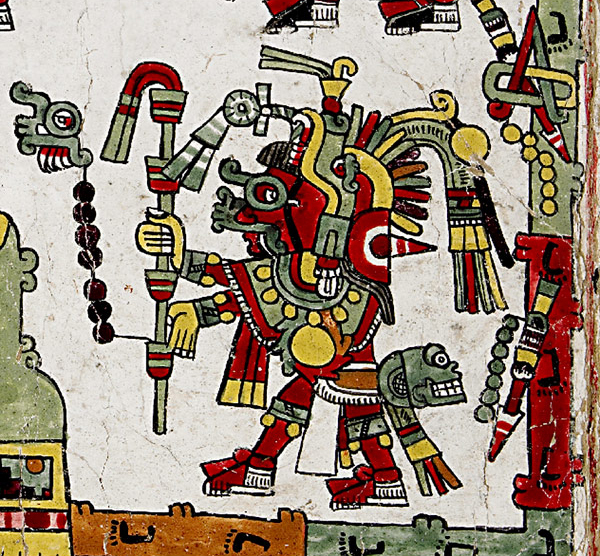 Tezcatlipoca: Trickster & Supreme Aztec Deity (Colorado, University of Colorado Press, 2014). Cite this page as: The British Museum, "Mosaic mask of Tezcatlipoca," in Smarthistory, March 1, 2017, accessed April 20, 2019, https://smarthistory.org/mosaic-mask-of-tezcatlipoca/.